The 2050 power supply and actuator is designed for integration into rotary or in-line, automated thermal assembly systems, and comes configured with one heat zone (no probe). It can be used vertically, horizontally or mounted at any angle. 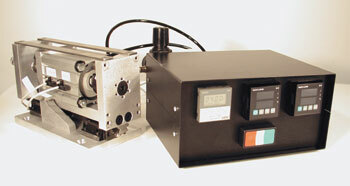 The 2050 (TBY021) actuator develops 120 pounds of force and is ideal for smaller inserts or stakes up to 1/4”. Its sister model, the 2050HD (TBY021 Heavy Duty), has a 1/4 ton of force and can do several stakes or inserts up to 3/8”. The 2070 actuator develops 1200 pounds of force. The power supply controls the air pressure, the dwell time and the heater temperature. It requires a remote start signal and it can be located separately from the actuator for convenient setting adjustments. It comes with a 6’ power cord and can be configured with up to 4 zones.